Ian Moss is not one to talk himself up. Despite being ranked by those in the industry as Australia’s greatest guitarist, ask the man affectionately known as “Mossy” about his prodigious skills and he’ll paint a far humbler picture. “I wouldn’t call myself a supernatural talent,” he said. “I’ll tell you; I’ve definitely got a good musical ear. I’m technically reasonably proficient. “There are some wizards out there who are just sort of actually monsters, demons, getting across the fretboard. That’s not me. There’s no doubt, however, that Moss puts plenty of feeling into his performances, whether he’s crushing the hard, driving rock anthems of iconic Australian band Cold Chisel or delicately picking his way through a wistful soul ballad from his latest self-titled solo album. And regardless of the style of music he plays, it is clear Moss feels its rhythm right down in the roots of his soul. “For me, it’s all that improvisation and trying to get better and trying to come up with new things,” he said. “There’s such a joy when you do discover something, and it kind of works and you practice it up, and then you get to play it with the band, and you go ‘ahh, that’s cool’. So you look around for the next trick you can do. “It’s just an unbelievably joyous feeling, and when you get to play with other players in front of people, it’s just the best thing. It’s something you just never want to give up. Born in Alice Springs in March 1955, Moss initially took piano lessons, but at the age of 11 he switched over to guitar and hasn’t looked back since. After moving to Adelaide as a teenager, Moss played in several fledgeling bands before forming a group called Orange in 1973 with songwriter and keyboard player Don Walker, bassist Les Kaczmarek and drummer Steve Prestwich. With the addition of a 17-year-old vocalist by the name of Jimmy Barnes and an eventual line-up change that would see Phil Small take over on bass, the group would famously go on, under the new moniker of Cold Chisel, to become one of Australia’s greatest rock bands ever. While he was known for his blistering guitar work, Chisel also gave Moss the chance to show off another string to his musical bow, taking on the lead vocals on such seminal songs as Never Before, Bow River (written by Moss) and a gorgeous rendition of Ray Charles’ Georgia. When Chisel imploded at the end of 1983 with their record-breaking Last Stand tour, it was far from Moss’ last stand in the music business, although it took a few years before he burst back onto the stage with his anthemic debut single ‘Tucker’s Daughter’, co-written with former Chisel bandmate Don Walker. Released in January 1989 the song was an instant hit, sitting in the Top 10 for 11 weeks and at #1 for two of those. Fifteen weeks after its release it had already achieved gold status, selling more than 73,000 copies. Moss followed it up six months later with his second single, ‘Telephone Booth’, which also cracked the Top 10 and remained in the Top 20 for ten weeks. Both songs formed part of Moss’ debut solo album, Matchbook, which was released in the August of that year and climbed its way to the top of the ARIA charts with three weeks at #1. The multi-platinum album announced Moss as a genuine solo star, taking out five categories at the 1990 ARIA Music Awards including Album of the Year, Best Male Artist and Single of the Year for ‘Tucker’s Daughter’. Between 1989 and 1996 Moss released a total of three solo albums before Cold Chisel reunited to record and tour a new studio album in the late 1990s. Another Chisel tour followed in 2003 before Moss finally returned to the solo scene in 2005 with his fourth studio release Six Strings, an acoustic album which featured material from his time with Cold Chisel, solo releases and cover versions of Jimi Hendrix and Credence Clearwater Revival songs. Two more solo albums followed, but it wasn’t until March 2018 that Moss finally released his first full album of original songs in 22 years. The self-titled album is his most personal effort yet, with Moss co-writing every song apart from ‘My Suffering’. Composed by his former Chisel bandmate Steve Prestwich and recorded as a demo in Moss’ home studio in 1991, the song had not been released until now when it was added at the last minute to Moss’ album as a tribute to his close friend, who died in 2011. “It’s just a great song, which just seemed to slip through the cracks year after year after year,” Moss said. “When it came to considering songs for recording projects, Cold Chisel seemed to pass over it. Steve seemed to pass over it for his own records, and I’d done a demo of it. In fact, that is the demo that’s on the album. I recorded and produced and mixed it way back in ’91. “And it was just one of those things that I’d kind of forgotten about because you’ve got so many songs and so much on your plate. “I was about to finish and sign off on the album, and it was actually Warren Costello, head of my record company, who said ‘Hey, you played this song once, tell me what it was called. My Suffering’ isn’t the only song that has been kicking around for a number of years. 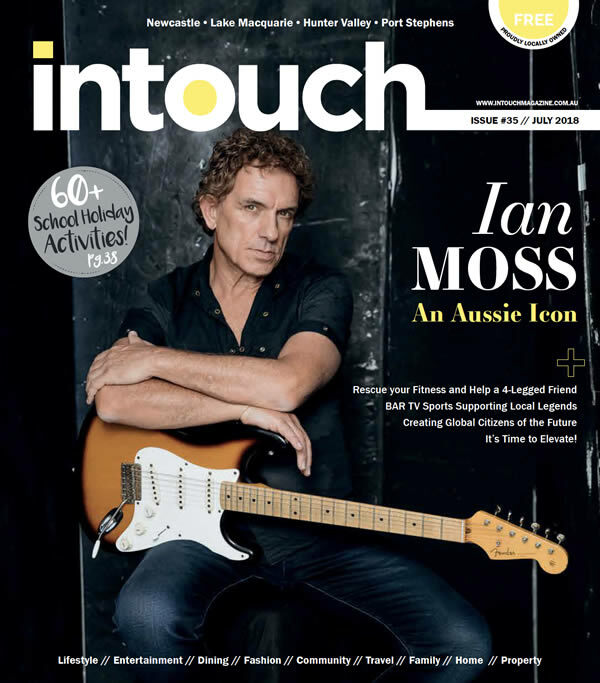 Moss readily admits to a penchant for taking his time when it comes to writing songs, while the initial recording sessions for Ian Moss were actually laid down with former Sydney singer-songwriter Sam Hawksley in 2011. “It’s just outright laziness,” Moss laughs when asked why he mulls over songs for such a long time. “No, I kind of laugh, but part of it’s true. It’s just a case of getting lots of ideas and getting them close to, as I like to say, sort of lying moribund. The lyrics, they’re the hardest part, getting lyrics that you’re happy with. And once you’ve kind of got those, they tend to help you tie up the last little bits of musical bits and pieces needed. The songs were completed in Nashville in 2014 following prompting from Hawksley, with Moss returning to Sydney to record them with the assistance of producer Peter Walker. “I started to do some recording (in Nashville) but discovered that you could have your great, raw material songs, but then after that, the arrangement can really make or break things. And that’s where I thought Peter Walker came into his own,” Moss said. “Peter Walker produced the first Cold Chisel album all those years ago. (He has got) just a fantastic ear for arrangement. It took us another couple of years (for this album), but when I think back on those ideas that came, you couldn’t have rushed them. “It’s just these great little musical nuances and melodies and things which, I could have written songs down maybe within a few months after getting back, but I just thought, no, I want to get these arranged as perfect as I can. “I waited this long; I might as well get it right. And I feel I have. “Some of the songs on the album are relatively brand new, and others have been around for many years. ‘It’s Not Over’ was one of those songs. I was going through a dark time way back in 1994 early 1995, and that’s when I first started writing it. Plus, it’s got my favourite guitar solo on the whole album. The album has been well received since coming out in March when it debuted at #11 on the ARIA charts. To celebrate its release, Moss is setting off on an Australian national theatre tour, taking in the capital cities in June and July followed by a regional tour that will kick off with a show at Newcastle City Hall on Friday, August 3. “We’re pretty happy with the reactions, very happy with the reviews, etc. and now we’re just quietly sort of pedalling away in the background promoting it and getting ready to tour with a big band around the country,” he said. “We’ve been rehearsing hard the last nine days, getting into shape, and it sounds really good, so it’s time to start letting the public have a look. Article written by MICHELLE MEEHAN and published in Intouch Magazine. © IAN MOSS 2019. Mosstrooper Touring Pty Ltd. | Privacy | Website by RedBilby © 2019.